In the 1800's, many stories began circulating throughout Southern California and beyond about a spectral ship lying half buried in the desert sands. Around that time, many migrants after Civil War passed through the desert on their way to California. Many reported that they saw a multi mast Spanish galleon. Multiple expeditions left looking for the ship, but none found it. Some claimed it was Noah's Ark. Many more claimed that it was loaded with pearls, a fortune's worth, millions of dollars worth of exquisite pearls. In 1610, King Phillip III of Spain ordered Alvarez de Cordone to search the Western coast of Mexico and recover the pearls residing there. Cordone hired two other captains, Juan de Iturbe and Pedro de Rosales. He also hired sixty pearl divers and began having three ships build. By July 1612 they set sail to plunder the west coast of its precious oysters. Over and over again the ship would pause in its travels so the pearl divers could jump off the ship and return with the oysters they discovered on the ocean floor. But the going was slow. Eventually they discovered a Native American village and stopped, meeting with the village leaders. They discovered that the Native Americans had baskets of the pearls just lying about and they formulated a trade of their rich fancy European clothing for the pearls. However, the Spanish swindled the Native Americans and traded them only rags and dirty cloths. The Native Americans outraged attacked the ship as it was trying to set sail. Cordone was hit by an arrow and lay ill. His ship was forced to turn around, but he ordered the other two on in search of more pearls, commanding them to look up the Gulf of California. As they journeyed up the Gulf, Rosales's ship struck a reef. The cargo was rapidly transferred to Iturbe's ship and they continued on. One story says that Rosales's ship was sunk in a terrible storm. With one ship remaining they sailed up the Gulf and eventually up the Colorado River and into the Salton Sea (or the Blake Sea or Lake Cahuilla as it may have been called long ago). Other versions of the tale, involve a pirate ship loaded down with almost a million doubloons. Another story states that the ship is one of the ships from King Solomon's navy, carrying the ten lost tribes of Israel to North America. Yet another claims the ship to be from a war like tribe formerly located in the Indian Ocean. Another puts the Spanish galleon on Lake Cahuilla, supposedly another name for the large inland sea that eventually became the Salton Sea. Lake Cahuilla existed in the 16th century and had a tribe of Native Americans living in the area at the time. Knowing that the Spanish were coming to take their treasures and probably hurt the tribe, the Cahuilla Indians instead ambushed the Spanish party that came ashore from the ship. Then the tribe mounted a full attack on the galleon and after a fierce battle, annihilated all the crew on board claiming the ship for the tribe. The Cahuillas began looting the ship of the clothes, foods, and exotic items that the Spanish had brought with them, but they could not move nor break into the heavy large iron chests that were in the hold. While they were debating what to do with the treasure chests a storm brewed up, and began attacking the galleon. The Native Americans were forced to desert the ship which broke from its anchor, drifted off into the storm, overturned and soon sunk into the sea taking its precious cargo with it. By the time the lake supposedly dried up, the ship had been long buried under tons of dirt, sand and silt. Quite possibly buried in the 1933 earthquake, a lost Viking Ship apparently resides in the Anza Borrego Desert State Park in San Diego County. In 1933, near Agua Caliente Springs, Louis and Myrtle Botts from the small town of Julian under directions from a strange prospector they had met the night before, stumbled upon the forward half of an old viking ship sticking part way out of the mountains in Tierra Blanco Canyon. Sadly shortly after they discovered it and before they could take any photographic evidence, a huge earthquake occurred and covered up the finding. Strangely enough, Native American legends actually support the theory that a Viking ship made it all the way around Canada, through the Arctic Circle and down the west coast. The Seri Indians' legend states that the "Come From Afar Men" arrived in a long boat with a head like a snake. These men apparently all had yellow beards and hair. They were also accompanied by a red haired woman. The Mayo Indians also have legends involving a possible Viking Ship. Their legend states that the ship sank off the coast and that the Mayo Indians took in the survivors. These survivors inter married with the tribe and this is the reason why even today occasionally descendants of the Mayo Indians are born with blonde hair and blue eyes. So just like a lost Spanish Galleon loaded up with pearls, a lost Viking Ship buried under rubble might exist in San Diego County. How true could this story be? 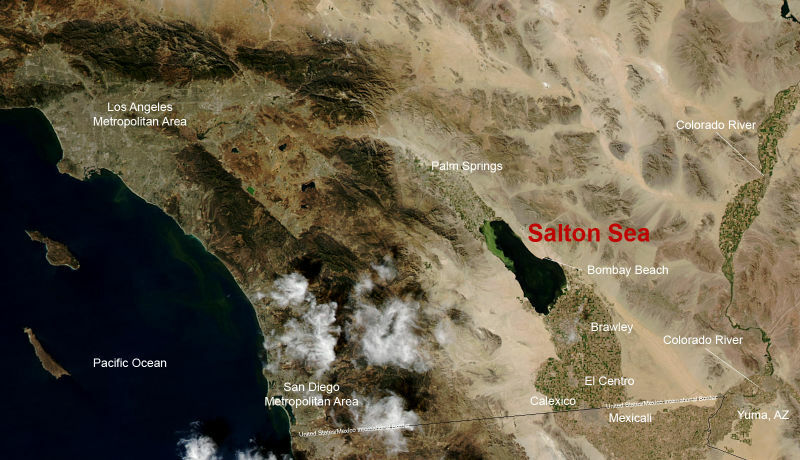 It is surprisingly possible that a flood occurred connecting the Salton Sea to the Gulf of California. Supposedly in the past the two were connected at one time. The area between the desert and the gulf has the potential to be hit with massive flooding. And it would have been plausible for a ship to get carried in on the waves and the stranded afterwards as the water receded. Additionally the waters there have been known in the past to have strange tidal bores that would sweep waves in land. A ship could have been carried inland by one of those. However, it must be from the sheer number of stories and legends told by both Native Americans and frontiersmen, that makes this story quite possibly true. In the 1800s the legends, stories, and failed expeditions began. Some claimed that the ship seen in the desert was haunted and could only be found at certain times of the year. Native Americans told tales about it, which was apparently good enough to confirm its existence. One group claimed that the ship came from 1862 when several people built a twenty-one foot single mast skiff mounted on wheels to transport themselves across the desert. Sadly when they reached the lowest point in the desert, they were forced to abandon the ship and continue on without it. They claim that the ship people saw in the desert was their abandoned wheel mounted skiff. In 1870 several Indians reported seeing the ship, supplying a location of approximately 30 miles west of Dos Palmas and 40 miles north of the then San Bernardino - Yuma road. 1870 continued to bring attention to the ship in the form of a series of stories in the Los Angeles Star on November 12th and December 1st of 1870. The stories spoke of a man named Charley Clusker who claimed to have located the ship and was organizing several expeditions to return to it and bring back the missing ship which he claimed was filled with crosses and had broken masts. It was reportedly fifty miles or more from Dos Palmas in a region of boiling mud springs. Sadly there was nothing afterwards, and Mr. Clusker appears to have simply disappeared much like the elusive ship. In 1878, three German prospectors saw the ship around sundown about 120 miles northwest of Yuma and 40 miles east of Indio. The two survivors reported seeing an immense ship under full sail, floating over the desert, sailing like a cloud into the sunset. One of the three prospectors went after it the next morning, but never returned. A rescue party eventually found him dead from lack of water and strangely naked. Later one old timer, reportedly spent several days camping inside the slowly rotting hull of the old galleon, completely unaware of the pearls and immense wealth that lay buried under the sand beneath him. Obviously, he was never able to relocated the derelict ship. In 1905, a prospector named Butcherknife Ike, claimed to have discovered a fossil ship buried in the sand dunes of Borrego Springs. And in 1915, a Yuma Indian arrived in one town paying for his merchandise with pearls. After being questioned, he claimed to have spent the night in a strangely shaped wooden house that was partially covered by sand. The people he spoke to offered him several hundreds of dollars plus a place to sleep for the night if he would take them back there in the morning. He agreed, collected his pay, agreed to be lodged for the night, and was no where to be seen come morning, having completely vanished. In 1933, Antonio de Fierro Blanco wrote a book that discussed the story of Tiburcio Manquerna, a young mule driver who had apparently come across the lost Spanish Galleon. At the time Tiburcio was operating as a mule driver for Juan Baptista de Anza who was searching for a land route from Sonora to Alta California. He even went into the hold of the ship, saw the pearls, but was never able to relocate the evasive ship. These events occurred around 1775. Even as early as 1949, three UCLA students, armed with old newspaper accounts, 1910 Imperial Irrigation District Maps, and old stories from Cahuilla Indians, went out to search for a Viking ship. The Los Angeles Times reported the undertaking, but sadly never told the results of the expedition, which leads me to believe that like so many others before, it too met in failure. Many treasure hunters have gone after the missing treasure of pearls. None has brought back evidence of finding it. One of the presumed reasons for this, is that the sands of the desert shift sometimes moving or obscuring or revealing the lost ship. And of course a ghost story has sprung up around the incident. According to story tellers, the ship itself, now bleached white and desiccated by the whipping sands blown by the desert winds, has become a ghost. With an eerie other-world glow and singing dead sailors, the skeleton of a ghost ship sails the desert. often being seen sailing into the sunset or along the moonlight. Of course, ghost stories are often in dispute, as another ghost tale places the phantom ship near Kane Springs, and the ship doesn't make a sound as it glides silently pass. Nor are any sailors in view. Does the mysterious ship laden with a fortune in pearls still reside in the desert? Or is it simply a strange story that has been passed down through the decades? Does it still sail spectrally over the sands, heading off into the sunset? Perhaps one day, when the sands blow the correct way, we'll be lucky enough to find out. For an actual ship that sailed the deserts of the Mojave in the 1940s, see The Muroc Maru. The ship was iturbes.came to rest at the southeast end of the superstition hills.buried under the sand now.iturbe and his men travelled up carrizo canyon. Down pinto canyon and east back to Acapulco. Leave signs in pinto canyon as to location of ship..
I’ve been in the Salton Sea several times & even then I could sense something big under water! & I certainly do believe about the Spanish Galleon being under sand where a river used to run but are dried up! Just as I believe that Rick & Marty from Curse of Oak Island! I BELIEVE! That when time is right what’s hidden will be seen again!!! How about Atlantis? Edgar Cauvery said that would rise again! I believe! This is a very true story. My Father Preston Johnson of Palm Desert is a pilot and we used to fly quite often when I was younger. He in fact told me the story as he got it from an actual desendant of Cordelone. We flew over the sight of the ships many times. It's very odd,about 28 years ago you could actually see the out line of one of the ships from the air. There were two ships in total. I'm going to get exact locations and altitudes of the ships from my father, and hopefully some pictures to add with them. How come no one will tell where this ship is located. If it's true that National Geographic excavated the site, then why not tell where it's at since there isn't anything of value there anymore, but I for one would love to see a Spanish galleon in the middle of the desert. Will, where is this suppose site? Locally no one really has a clue about the lost ship. In Julian you can hear a story of a Viking ship but nothing about a Spanish one. How come National Geographic never published this find? Love to hear more about this rare find. I was among those that made the original discovery of the ship. I was about 14 years old in 1968-69. It is indeed a Spanish Galleon. The only parts of the vessel exposed were the tip of the front mast and the upper most part of the main mast. My father and his friends marked the spot and suspecting it was a ship contacted National Geographic Society. They came out, set up an excavation site and dug up the vessel. I visited the site many times to check progress and hoped to get information. As long as the NatGeo teams were there I was never allowed in or given info. Years later after NatGeo abandoned the site I learned that there were no valuables on board, only pieces of dinnerware, and other things of intrinsic value. To MAX: hello, I am a San Diego resident and "explorer" , at least of areas I can drive to HAHA. I have an interest in the desert area to the east and would love to pick your brain on cool spots to check out. Well not sure if email notifications get sent on this, guess I'll check back later. Having grown up and lived here most of my life, from age 3 to now 56. I've come to know and have seen many things out here in the desert. The early Indians locally, "Cahuilla'etc.. traded with tribes from central America and southern Mexico. The local tribes paid for ceremonial peyote and Mushrooms with Emeralds.The whole area from Blythe to Borrego is littered with Geodes of all types, if you know where to look and what to look for.Wherever there is chocolate brown rock there's Gold, and many other minerals. Crystals 7-10 inches in length lying on the ground.Geodes will appear to look like what I call brain matter and somewhat chalky to pale tan in color.The old mine maps of the area will show Berryllium mines which is the mineral emeralds come from. yes there was one here and Emeralds have been found in the area, as well as gold.People are very tight lipped in general about these things, but by and large few have seen and touched what I have in these past 45 years of exploring out here from Blythe to Yuma to Calexico to Morongo Valley up into 29 Palms and beyond.Be aware the desert will show you many things don't be alarmed or scared, just experience it and move on don't dwell on was it real, or not ? Above all don't lose or doubt your sanity, should you venture out here alone. NOT to dweel on this but I came across the Digger gary this past June 2013, he had a lot to talk about, between his florida to maryland beachcombing, coinshooting etc,, he did a quick ??? month long by the salton sea but has finally given this whole lost ship idea a waste of his time. after all those years too.. he will be now going for the easy finds aka coins and beaching .. well hope he makes it take care all. Great site: Here's my story,Back in 1967,when I was 17,now I'm 62 and sitt'n in the back seat with my school buddy. His Dad driv'n and his Geologist/treasure hunt'n friend,next to him.Went for Hamburgers and on the way the Geologist was tell'n his Dad 'bout "his" exploit "digg'n for a Spanish Galleon in the Imperial Desert.I love these stories. He took a D-2 type of dozer and installed a drill that bit into and pulled out Mediteranean wood,he had it analized.This was back in late 50's.I found him in 1979 work'n with a mine in Montana and got him together with a Gemologist and they rented a plane with a manetometer and told me they "found the spot".They had a fall'n-out and me sad "of course". David Whitecrow, the moon doesn't cast any shadow. It actually reflects light from the sun shining on it. That's how you can see the moon. There's only one way the moon can cast a shadow and that's during a solar eclipse. Unfortunately, the shadow is hundreds of miles across and couldn't pinpoint anything. For doubters of any "ships in the desert" just remember: Rumors are usually based on facts. I don't see these stories of Ships in the Desert being that far fetched given the fact that Anza-Borrego Park has some of the most well preserved fossils in the canyons of ancient sea-life! I believe it is possible, whether Viking or Spanish-either way its an intriguing Thought. Also, I remember watching a program about a n 18th Century ship being accidentally unearthed (U.S. I believe) And all of its contents were so well preserved they have them on display. I was searching ships found in the desert from a childhood memory I had from about 1965. My family is generations back in the Calexico area and we used to ride dune buggies out at Mt Signal and the superstition hills. I remember when I was about six years old we came across the remains of a very large wooden ship carcass in the hills. The area had wooden stakes with 'cans' attached with a papers in them in the 4 corners of the site. I remember my dad taking out the paper and reading it and commenting on that it was a excavation site of a Spanish ship. I'm now curious what it really was? strange as it May seem i bumped into an old beachcomber back in 1972 that off and on for the last 30 plus years will head out to the desert in search of this lost ship/ last i seen of him was this early May as he was leaving for the east coast again and getting ready for the Hurricane season also down florida way he gose by the nickname "" digger gary "" me i am up and down the California Coast from mid May to usually Mid October every year.. beachcombing .. anyway just wanted to let all know that there must be something to this lost ship as no man would search for it all these years unless he knows something thats NOT been printed etc.. I must confess I think is a beatiful story but there is no real evidence of spanish ships lost in that area not to mention one of the names you talk about in your article isn't even spanish. An BTW, I don't need to visit the spanish national navy museum to realize those captains never existed. BTW, Felipe II died in 1598... I have my doubts about him ordering to search for pearls in 1611 ;-) Again, is a beautiful story. Perfect for the sequel of "The goonies"
I know someone who has "authenticated" Spanish cannon shot in his possession that was found in the desert at The Salton Sea over 40 years ago. I held it in my own hand! This is not just some torist attraction. When the stories started being reported, there was nothing out there for anyone to make any money off the stories. In 1970 my father was comming home from Palm springs to Riverside and he was looking to the south just outside of Palm Springs and he had never heard of any "ship" stories. However he came home with the news that he saw part of a ship and mast sticking out of the desert sand. I believe him. There are three other legends about Spanish (presumably) ships in the Salton Sink: 1) there are maps in an archive in Spain which show that in the early 1600s there were navigable waters in the Colorado up to about Blythie or Parker, in the Salton Sea to the Mecca/Indio area from the Gulf of CA (about 10 years ago, I was directed to Spanish website where I saw those maps); 2) that an early Anglo resident on the East side of the Salton Sink was rumored to have found a shipwreck in a canyon containing not pearls, but gold and annually made long trips back to the East Coast (hopefully, in the Summer); 3) local Indian elders have a story of a great white "bird" flapping its wings in the middle of the Sink - presumably the tattered sails of a ship. As for the Viking ship, if Greenland was green in 960 and Vineland had vines in 1000, there very well could have been an ice-free route through the Canadian Arctic during the Summers until the Big Chill. Further, there are stories out of Nevada about red-haired white men who fought with the Paiutes. Some bodies were supposedly found in caves both in the south around Jean and in the north around Reno.